The Story Behind Sam’s BBQ-1 Restaurant. 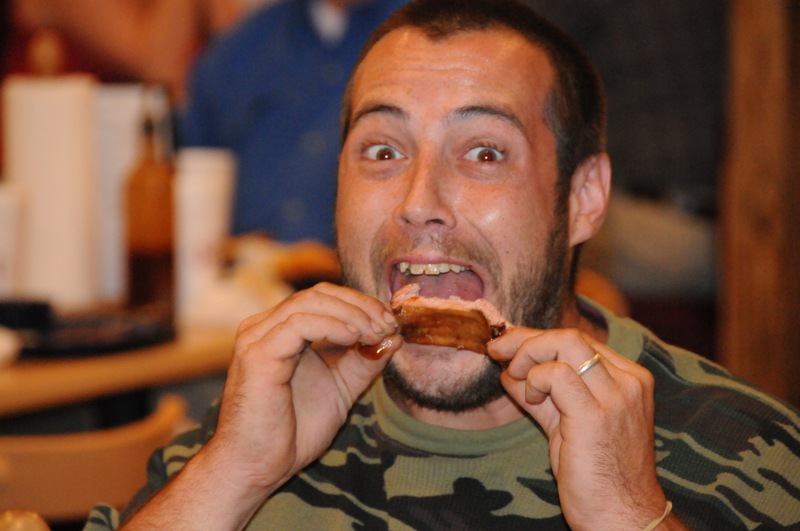 Sam invites you to visit either our East Cobb or West Cobb locations (both in Marietta, GA) to sample some of our award winning bbq. Sam Huff opened BBQ-1 in 2004 as a weekend take out operation. 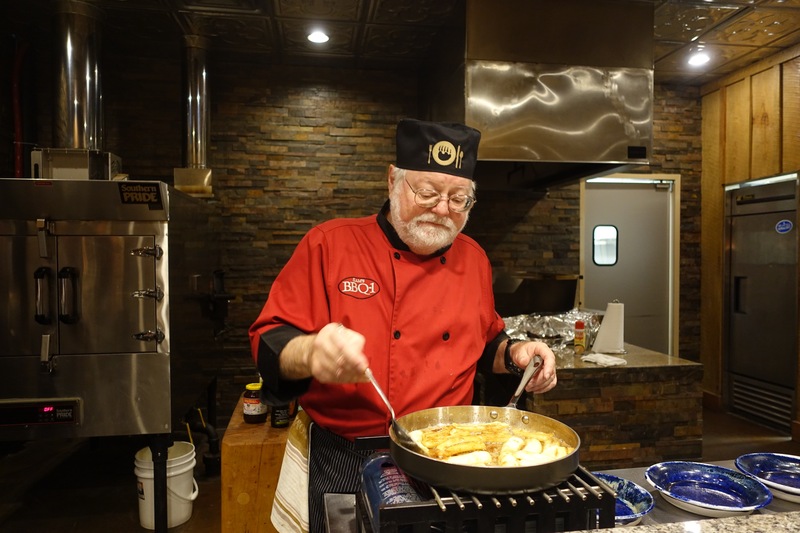 Sam was a full time practicing attorney at the time and the intent was to have a place to cook for the growing number of charitable events, family gatherings, friends and civic organizations in which he was involved, as well as have a place to stage his long time hobby of cooking in barbecue competitions. His friend Dave Poe joined him and the operation became known as Sam and Dave’s. Life was simple and uncomplicated in those days. Because there was never any intent to develop a real restaurant, no thought was given to issues of food costs, time-labor ratios, generic food discounts and other issues that “ real “ restaurants are taught to consider. All they did in the beginning, ( and still do), was use hand made sauces and rubs cooking with the techniques learned over many years of cooking competitions. No thought was given to the cost of ingredients- only the best were used. Quality was the goal- not quantity. Soon, however, the place was discovered after a glowing review was printed in the AJC. The place exploded and has grown ever since. The partners hired Chef Dave Roberts to be a full time manager and later, a partner, to run the operation full time. A few years later, in 2006, they built BBQ-2 in West Marietta. A few years after that, all the partners amiably parted ways. Dave kept the West Marietta location and calls it Dave Poe’s BBQ and Dave Roberts opened his own place in Decatur called Community Q BBQ. Both are excellent barbecue destinations. 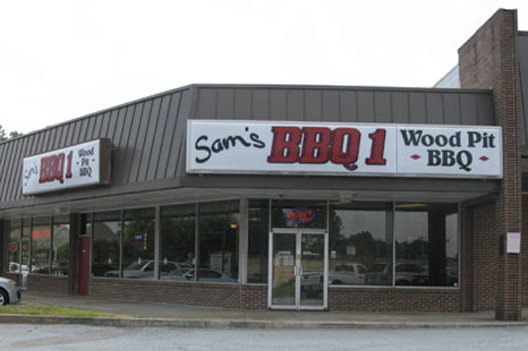 Sam kept the original location in East Cobb, named it Sam’s BBQ-1, and soon expanded into the space next door to build a full service, seated restaurant. 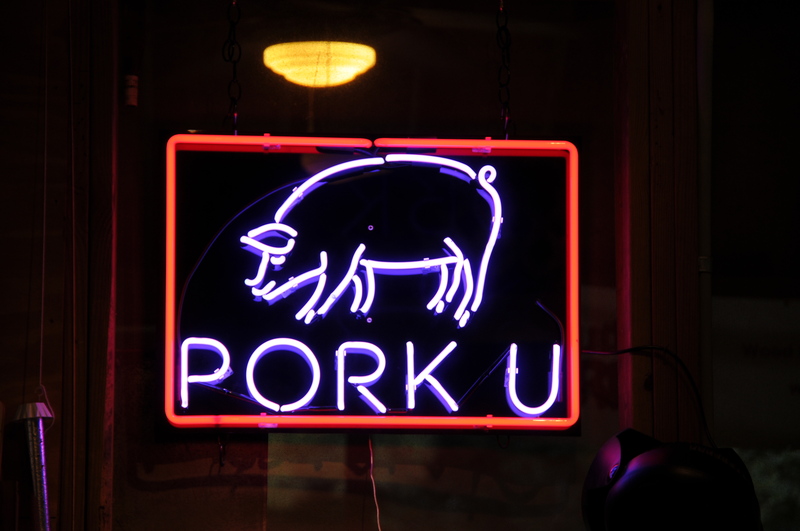 Around 2009, Sam phased out his law practice and began to devote his full time to the restaurant, teaching barbecue cooking classes known as Pork U, developing sauces and rubs commercially for retail sales and consulting in barbecue restaurant development. His second restaurant in West Cobb in the Village Green Shopping Center, across the street from The Avenues of West Cobb, on Dallas Highway opened in October 2013. Sam sold his West Cobb restaurant in 2018 to Ken Holland, his good friend and former cooking team member. Since then, Sam is devoting all his time and attention to his original East Cobb Location. Depending upon which review you read, Sam’s BBQ-1 is the best barbecue in Metro Atlanta, North Georgia or the entire state. We consistently appear in Atlanta Magazine’s “A List“ and in their listing of Atlanta’s Top 50 Restaurants each year. Zagat gave us their highest food quality rating of any barbecue restaurant in Georgia, with only 2 barbecue operations in the country rated higher. The reason for our success is simple. Use of the highest quality ingredients matched with old, traditional cooking techniques while smoking meats in the worlds most modern, advanced wood-burning pits. However, you, our friends and customers, are the real source of any success we may enjoy. At a barbecue competition, we are judged by 6 strangers. At the restaurant, hundreds of you judge us every day. It does not matter in the least if we won a Grand Championship 10 years ago. All that matters is how well we cook for you today. So thank you for being part of our barbecue family. We look forward to serving you for many years to come.